Obedience training with your Beagle is very rewarding for many reasons. Even though you may not be interested in doing an actual obedience trial to have your Beagle walk to heal when in company, sit on command and not jump up at every stranger that you meet is a credit to the owner. Try to get your Beagle enrolled in a puppy school which is attached to an Obedience Club so that there is continuity for both the owner and the puppy. Get a list from Dogs Victoria and phone up the secretary of the club and the first thing you should say is, “I have a baby Beagle and would like to bring him to your Obedience Club’. If you get “hysterical laughter” at the other end of the phone with comments like, “You must be joking” or “You’ll never train a Beagle” put the phone down and call another club until you get a positive response. Ask the secretary of the club if they permit food reward and again if they don’t – go to another club. Ask if they use positive reinforcement. Again if they do not go to another club. Beagles are easy to train so long as the owner knows what is required and how to get the best out of their dog and do not take it too seriously Laugh when things go wrong and try again. Some say that Beagles are not intelligent but they are very smart. They are not blindly obedient and will not do the same thing day in and day out or repeat commands for 5 or 10 minutes at a time. They need to see a purpose for what is being asked and they get quickly bored, therefore, variety is the key to success. 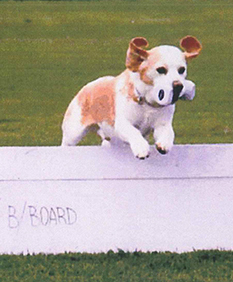 There is nothing nicer than seeing a Beagle performing well in an Obedience Trial as all eyes will be on him.